Woodstock – Mrs. Ethel Louise Kelly Hardwick, 92 of Woodstock, formerly a resident of Tifton for over forty years, died Saturday, February 02, 2019, at her residence surrounded by family. Funeral services will be held at 2:00 P.M. on Wednesday, February 6, 2019, at Ridge Avenue Church of Christ with Mr. Harold Chambers officiating. The family will receive friends before the service from 12:30 - 1:45 P.M. at the church. Interment will follow the service at Oakridge Cemetery. Her grandsons, Douglas Christie, Ryan Christie, Alan Christie, Harrison Hardwick, and Blake Niesielowski, along with Randy Chambers will serve as pallbearers. Mrs. Hardwick was born October 7, 1926, in Chattanooga, TN, as the daughter of Stephen Austin Kelly and Johnnie Louise Roan Kelly, both of whom preceded her in death. She was also preceded in death by her husband of forty-two years, Dr. H. Douglas Hardwick, who died July 25, 1990, her sons-in-law; George Mitchell Chambliss, Dr. Sammie Daniels Dixon and Steve Niesielowski; brothers; Kenneth Alverson, Bob Kelly and David Alverson and grandson-in-law, Kyle Andrew Chambliss. Mrs. Hardwick was a bank teller in Chicago while her husband was in Northern Illinois College of Optometry. 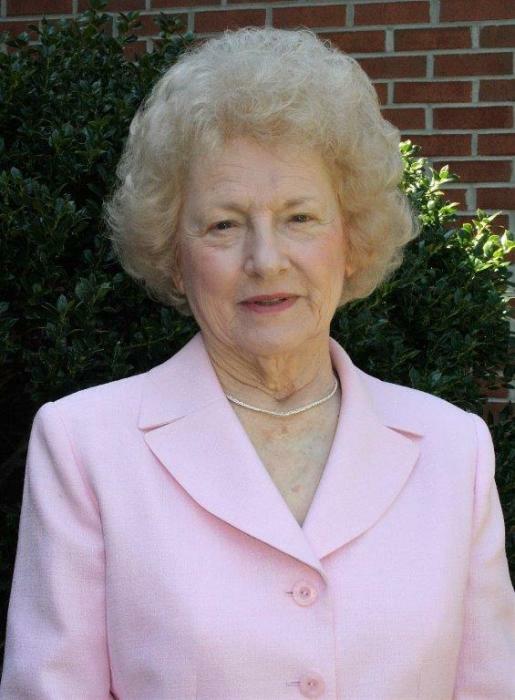 While in Tifton she was very active at Ridge Avenue Church of Christ, including teaching children’s Sunday School classes, Past President of the Twentieth Century Library Club, enjoyed her bridge club and being a member of the Council of Garden Clubs of Tifton. She also volunteered in the elementary schools that her children attended as a room mother and in the PTA. She was an amazing cook who shared her many talents being hospitable to many friends and visitors of the church. During her time in Woodstock she was active at Piedmont Road Church of Christ in Marietta. Mrs. Hardwick was survived by her children Lynn Dixon of Greensboro, Brenda and Sim Christie of Woodstock, John and Jan Hardwick of Loganville, Larry Hardwick of Winston and Carolyn Niesielowski of Santa Rosa Beach, FL., her sister; Betty Myers, of Granbury, TX, sister-in-law; Bobbie Alverson of Ringgold, grandchildren; Douglas and Melissa Christie, Ryan and Marcie Christie, Jordan Kelly Chambliss, Harrison Hardwick, Blake Niesielowski, Jonathan Hardwick, Alan Christie, and Lindsay Hardwick, great grandchildren; Michaela Christie and Madison Christie. The family is grateful for the exceptional care she was given by Camellia Place and Homestead Hospice. Flowers will be accepted or donations may be made to Ridge Ave. Church of Christ, 1625 N. Ridge Ave., Tifton, GA. 31794 or Raintree Village, 3757 Johnston Road Valdosta, GA 31601.